A social drama directed by Franz Osten, the classic movie Bhabi tells about the injustice of society towards young widows. The film portrays the issue of society's narrow mindedness about man-woman relationships. Produced by the Bombay Talkies the movie was released in the year 1938. Bhabi is the story of an upright young man named Kishore (played by Paidi Jairaj) who promises his dying friend to take care of the latter's wife, Bimala (played by Maya Devi), left all alone in the world. Kishore brings Bimala to his house, where they live as brother and sister. Society disapproves their relation. Meanwhile, Renu (Renuka Devi) comes as Kishore's neighbour. Later Kishore and Renu fall in love with each other. In between so many misunderstanding happens and finally everything is cleared. 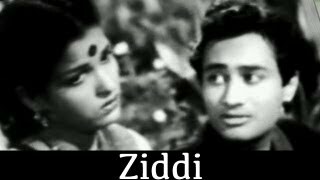 Composed by Saraswati Devi, the song Jhuki aayi re badariya saawan ki from Bhabi, which captures the beauty of Indian monsoon, is considered to be one of the ever time “saawan” songs in Hindi films.